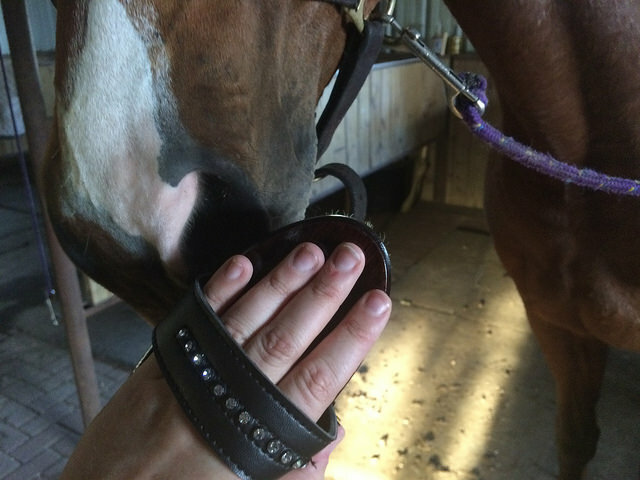 I’ve mentioned this before, but I’ve been a fan of Horze products for years prior to them asking me to review some items on this blog. In my opinion, this is a great online retailer to search for solid basics… especially during their sales! One of my first orders from Horze included some grooming supplies, so it only makes sense that I would happily review some additional brushes and grooming equipment from them. 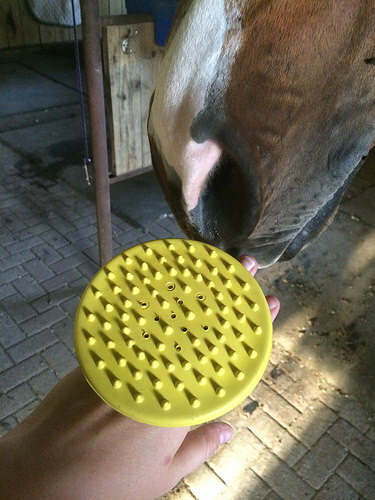 Though I don’t have any pictures, I have happily used the Horze Happy Face Brush and the Soft Grip Hoof Pick for years. Though neither of these items are revolutionary in their nature, the hoof pick has a nice feel to it and removes dirt out of my horse’s feet. As for the face brush, I’m a big fan but let me explain why because it’s relative for the rest of this product review. I have stupid small hands. When grooming, I routinely use child size brushes and curry combs because I hate big hunking brushes. Therefore, my review of the following items are going to be swayed towards those who have a glove size 7 or smaller. You’ve been warned! First up from the Horze brushes is the Horze Deluxe Classic Body Brush. 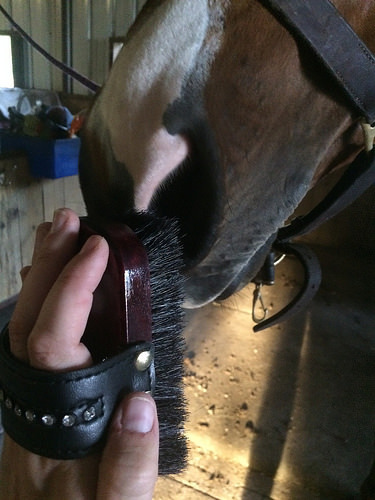 This brush has two things that I have never owned in grooming equipment – natural horse hair and sparkles. 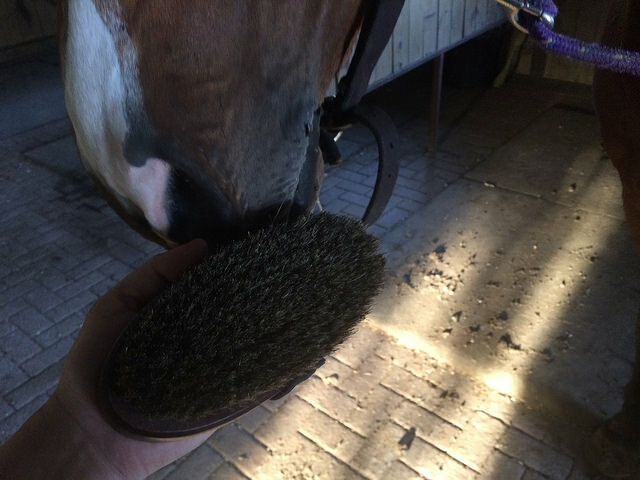 At first I was concerned that natural horse hair brushes came from slaughter horses, but some googling told me that the hair is harvested from live horses… so that made me feel better. Anyway, this brush is really well made. The wood is shiny and mahogany in color, and the sparkles give it a special occasion kind of feel. As for use, the natural horse hair flicks dirt off much better than the synthetic brushes I had been using past. I was really happy with how clean and shiny I was able to get Simon after using this brush. Enter the Horze Deluxe Mini Body Brush! This body brush has all of the great features of the full size, but fits my small hands much better. It flicks dirt off just as well, and is also really good for doing legs since the smaller surface area fits the contour of legs well. Between the two body brushes, this one is hands down my favorite. A+. It’s nice enough that I wouldn’t hesitate to pay full price for it, which is $11.95. The next item I reviewed is a lot less traditional, the Horze Lemon Massage Curry. Now the craftsmanship on this item is not as good. The handle is made from cheap plastic, and will pop out if you pull it too hard on an angle. For the full price of $4.95, I’m not sure just how much that matters… but it is a factor. For my grooming experiment, I used this massage curry as a traditional curry comb. It does get caked mud off just like a curry comb, but unlike a curry comb it doesn’t collect dirt in the pockets of the brush. Basically, when you curry dirt off with this thing it goes flying everywhere… mainly onto your hands. Not a great feeling. 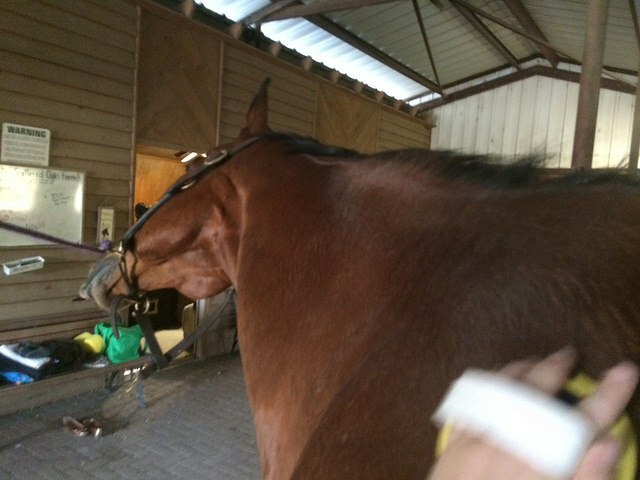 What I would use it for however, is a massage on a clean horse. Duh you say, since “Massage” is in its name. Simon loved being curried by this brush, as evident from his itchy faces. I got a more pleasurable reaction from him using the Lemon Massage Curry while having to exert less force. So for massage purposes, this is a great buy for under $5. It also fits the “small hand test” pretty well, so that’s a bonus for me. The final item I got from Horze was the Thick Done Bone Shape Sponge. This is a sponge. It’s large. It absorbs water. It does sponge things. 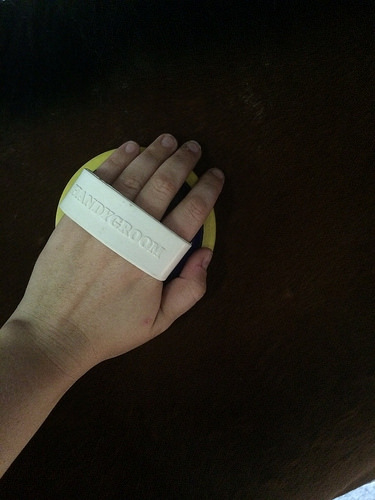 For a little over $4, it is a cheap sponge and I like it. Not sure what else to say about that! 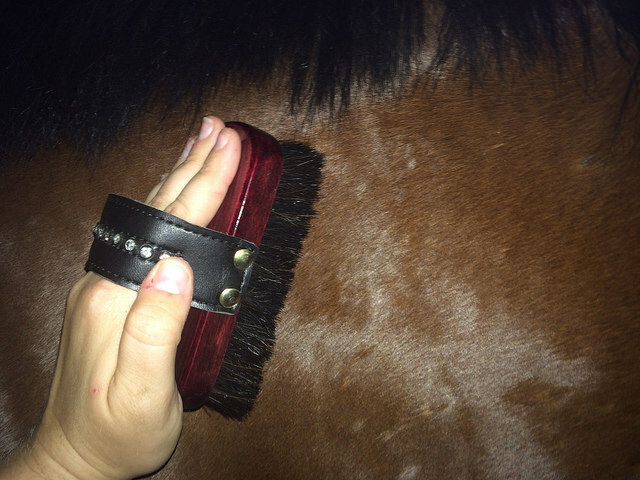 These are just a sampling of the grooming supplies that Horze has, and I think a great place to pick up some barn staples… especially if you also enjoy fancy sparkles on your brushes! I have tiny hands too. Most brushes are way too big doe me. I have the blingy brush too! I also have child sized hands, and wish I had seen the smaller one before I bought the big ones. But I manage ok with them. And I mean… sparkles! I want a sparkle brush. OHEMGEE I need the rhinestone brush! !